On our last night in Skye, after we returned to our B&B, Cathy and I watched "Milk", the story of Harvey Milk's life and death. We chatted and commented on blogs on Cathy's Notebook while drinking a dram or two of single malt, which I had never liked before, but for which I acquired a taste due to Cathy's repeatedly putting a glass of the drink in front of me. She made me do it. You know how that is and shame on Cathy. While we were walking from the car to the house, we slapped at a few midges. Once we were in my room, we felt more bites, and I killed more than a few of the annoying insects that I saw on the bed. Where were they coming from? We couldn't have carried that many in with us when we entered the house. I checked the windows, and both were closed. After Cathy left, I slapped at the remaining midges on the bed and got ready to go to sleep. One of the bed pillows was on the love seat in my room, and when I looked at it, it was covered with midges, like the picture above! My picture is a crude Photoshop, and the size of the midges is way out of proportion, as the insects are tiny, but it gives you an idea of what I saw. I gently picked up the pillow and placed it on the floor outside the door to my room and went to bed. 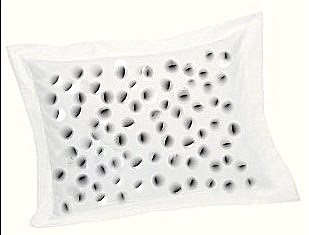 What attracted the large number of midges to the white bed pillow? Not for a second did I believe that all the midges were out of my room, and sure enough, after the light was out, I was still slapping at them as they bit me. When the midges were not actually biting me, I imagined them biting me, so, as you can guess, I slept very little that night. Unfortunately, the next day was a marathon travel day, beginning early in the morning, and involving ferries and trains after we turned in our car. The B&B was lovely; the rooms were beautiful, and each morning we were served a delicious breakfast. I doubt that the large number of midges in my room was the fault of the proprietors. The midge, also known as "midgie" or "midgy", is a tiny flying insect of the genus "culicoides". There many thousands of known midge species, of which only a few bite. One of the most ferocious biters is the Highland Biting Midge, Culicoides impunctatus. This is known in Gaelic as "Meanbh-chuileag" which means "tiny fly". Any signs of the dreaded Terriers of Skye? If you slap them, they'll attach themselves to your ankle and never let go! Clumber, I don't recall seeing even one Skye Terrier, and certainly none that attached itself to my ankle. We managed to drink quite a respectable amount of single malt that evening (especially given that one of the two of us claimed she didn't like it). The midges were weird. How they got there and why they liked that pillow is a mystery. You should have spoken to the management, Mimi! Either they would have had an explanation like we do here in the US along the lines of "Oh really? That's never happened before. Sorry." Or they would have been highly embarrassed and refunded the night's lodging(maybe). I'm sure you would have done it gently enough that the latter would have happened. Susan, we were leaving, but if I'd had to spend another night in the room, I would have said something to our hosts. I was embarrassed for them, because everything else about the place was lovely. Plus, I don't like to make a fuss. It was a lovely place, Peinmore House. I nearly point blank refused to leave and insisted that I be allowed to live there. Me too, Ann, all over again. I wish I knew how to pronounce "meanbh-chuileag". The Mad Chauffeur was quite dismissive of people who speak Gaelic. I don't know why. I'd love to be able to speak it. Let a language become extinct and you lose a whole culture and history with it. Not that Gaelic is extinct, but that's only because of efforts made to preserve it. Cathy, I think Gaelic is well worth preserving, just as I do Cajun French. The difficulty with Cajun French is that it was mainly a spoken language, since a good many of the Acadians who came from Canada were not literate. Only fairly recently have attempts been made to transcribe the language into written form. drinking a dram or two of single malt, which I had never liked before, but for which I acquired a taste due to Cathy's repeatedly putting a glass of the drink in front of me. She made me do it. Yeah, yeah, yeah, and Adam was tempted by Eve, who was tempted by the snake! When the midges were not actually biting me, I imagined them biting me, so, as you can guess, I slept very little that night. ...which could have been remedied by another "wee dram" (or three) of the Scotch! C'mon, Mimo! Sorry - if I had thought I would have warned you to take skin-so-soft from Avon. Smells iffy but is used by the forresters around here. And lights on and windows open is a definite no in the west of Scotland, especially at this time of year. Hope it didn't spoil your visit. Freda, Grandpère uses Avon Skin-so-Soft to keep the mosquitoes and gnats away when he's fishing. I had no idea that I'd have such a miserable experience with the midges IN MY ROOM.